Can you imagine a home without houseplants? Caring for them provides a Zen moment, in which you can forget about work and routines – and pretty well everything else. You can ensure that your plants flourish by giving them the right amount of water, light, fertilizer – and love. At this time of the year, plants are already awaiting some tender, loving springtime care. 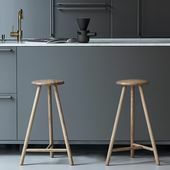 Artek's Riihitie pots are best for decorative use as they don't have a drainage hole. They can also be used as planters, if you first add a layer of expanded clay gravel on the bottom. The white pot hosts a porcelainflower and the blue pot a common staghorn fern. Last year's best-sellers were the Chinese money plant, the fiddle-leaf fig, and Monstera. A more delicate version of the tall-growing Monstera has appeared. Known commercially as Monkey Mask, it belongs to the species Monstera adansonii. Low-maintenance palms, such as the Howea, which is reminiscent of the 1980's, have also caught on. Other rising stars include the banana tree and bird of paradise, as well as the hardy Elkhorn fern and bird's-nest fern. Cactuses and other succulents also retain their top-billing. The impressive African milk tree and easy-care 'mother-in-law's tongue' provide statuesque focal points. The impressive African milk tree and easy-care 'mother-in-law's tongue' provide statuesque focal points. The Grow mini greenhouses from Design House Stockholm are great for growing small houseplants such as Chinese money plants. 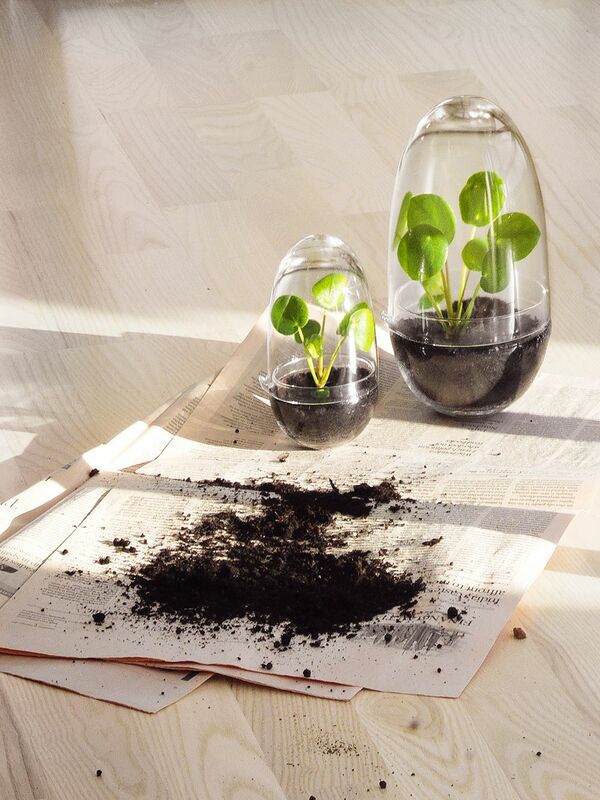 Grow comprises two glass parts: the bottom is for the soil and the top functions as a cover and a watering can. Not all species need to be re-potted each spring, some can flourish in the same pot for several years. Re-potting is necessary when the roots fill the pot and the soil has compacted. The plant should always be transferred to a pot that is a few centimetres bigger than the last one. Larger plants can be split into several shoots. New, fresh potting soil should be chosen, with nutrients and an airy structure which will spur root growth. Most houseplants sold in Finland are grown in a peat-based soil mix. You should exchange this immediately for a 'flower' mix of sand and soil, which has better water retention than peat. 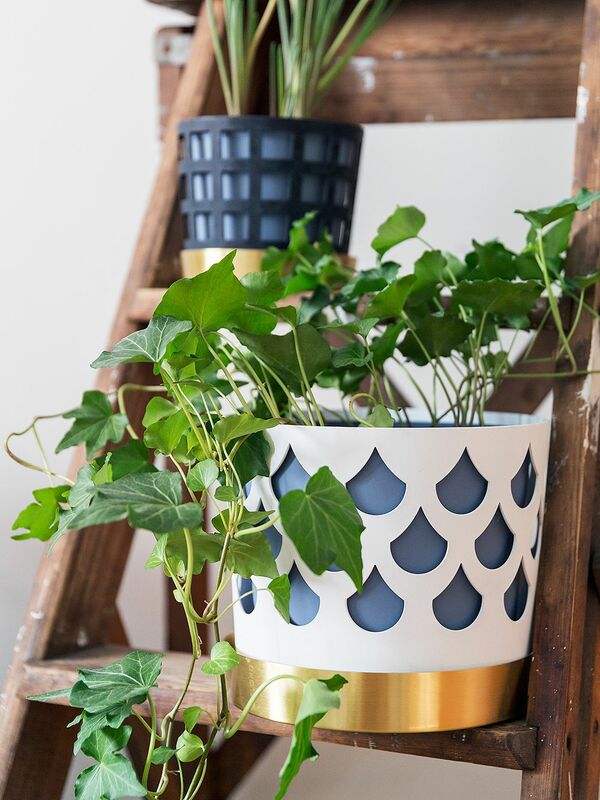 Klong's Trio flower pots feature three different elements: a blue metal pot, a beautiful outer shell with a perforated pattern and a tray in lacquered brass. Ivies thrive in indirect sunlight, and in summer, they can also be planted outdoors. At best, pots form part of interior decor and are one of the factors that create ambience. Ceramic pots, which bear the hallmark of the maker, are currently the height of fashion. They can have bumpy or grainy surfaces, or be organically sculpture-like. The colours are earthy, often with a tint, while the glazing has a 'runny', spontaneous look. 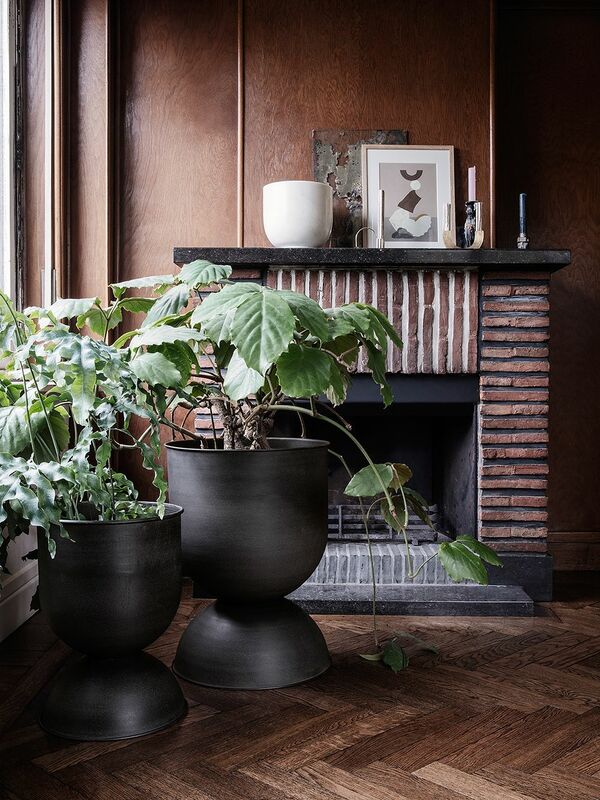 More tuned-in lovers of houseplants favour evenly glazed pots, freshened with brass decoration. At best, pots form part of interior decor and are one of the factors that create ambience. The Botanic Shelf collection features multifunctional shelves designed by Riikka Kantinkoski and Pinja Rouger for Adea. 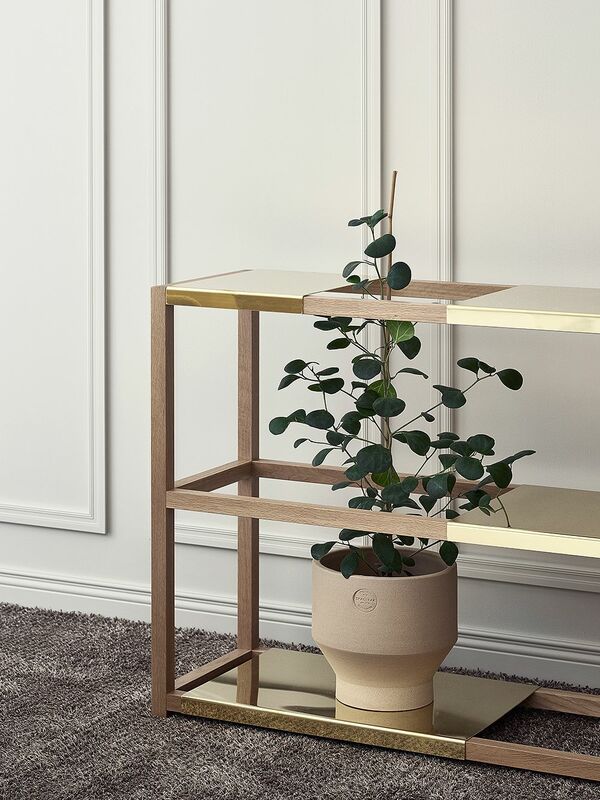 The elegant brass shelves can be moved freely on the solid oak frame to leave openings for taller houseplants. The beige Edge pot is from Skagerak, and the plant is a triangle fig. Wipe shiny leaves with a damp cloth to remove any dust that has gathered during the cold season. This will remove any material covering the epidermis; such material hampers the reception of light and photosynthesis. It is best to wipe the leaves on a sunny day, since the ultra-fine gossamer webs of red spider mites, which nest on the lower surfaces and stalk-bases of the leaves, show up well in bright light. You should also check the leaf stalks and the plant's stems. Plants weakened by winter also fall prey to soft scales, and to small black thrips which scamper quickly across the leaves. Hidden inside their cotton-wool-like secretions, mealy bugs stealthily appear in the crevices of cactuses. You can use a matchstick with a little cotton-wool on the tip to dig them out. 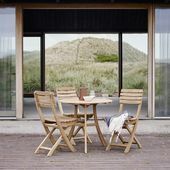 One of Ferm Living's new arrivals is the Hourglass planter collection, suitable for both indoor and outdoor use. The large, eye-catching metal pots can be used on both sides to suit the size of your plants. 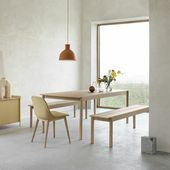 The Hourglass collection will be available at Finnish Design Shop this spring. Plants can be moved to favourable locations as part of your spring care routine. As the light fades in the fall, move every plant that will fit there to a window place. 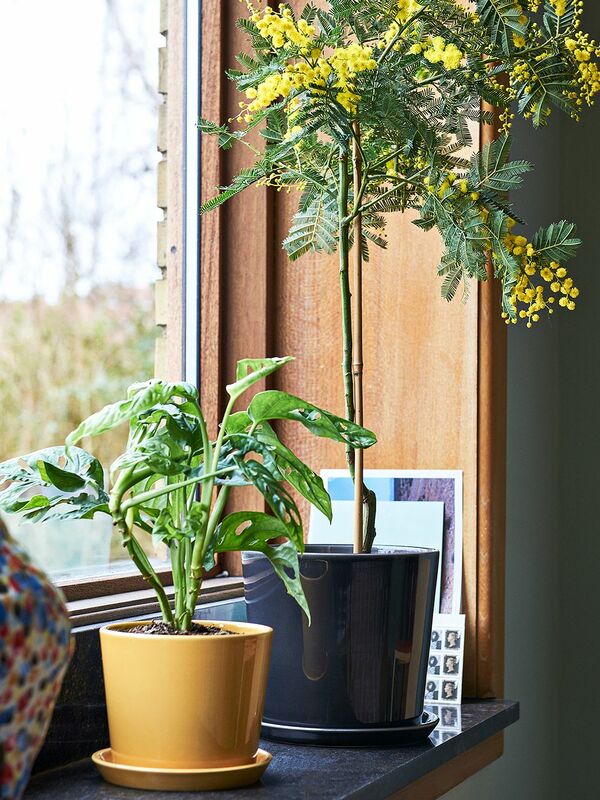 As the spring sun grows brighter, you should ensure that thin-leaved rainforest ferns and African violets, whose leaves are prone to heat damage, are placed out of intense sunlight. 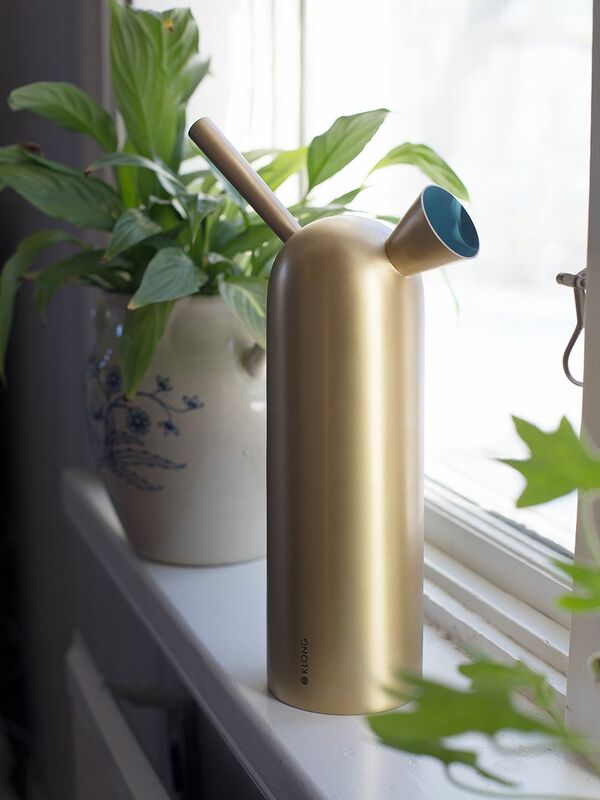 Svante, designed by Mats Broberg and Johan Riddestråle for Klong, is a tall watering can that doubles as a decor object thanks to its sculptural design and an attractive golden sheen. Houseplants flourish if regularly watered from early spring to late summer. You can assess the need for watering more precisely by testing the dampness of the soil with a finger or lifting the pot and feeling its weight. Most plants should be watered via the soil surface, but it is advisable to water the downy-leafed streptocarpus, gloxinia and African violet from the plant saucer. Allow the water to soak in until the surface soil feels moist. Pour any excess water away. All plants benefit from allowing the water to warm and oxygenate in the watering can. Houseplants flourish if regularly watered from early spring to late summer. Hay's Botanical Family collection features flowerpots and base plates in glazed ceramic and brass. They come in three sizes and four colors. The flora in the yellow planter is a Monkey Mask, and the tree with yellow flowers and feather-like leaves is a mimosa, also known as a silver wattle. Start to use fertilizer when the plants begin to grow in March. If the plant is re-potted into fresh soil, allow it to settle and put down roots for a few weeks before adding fertiliser in the water given to the plant. Select the fertiliser on the basis of whether the plant is a flowering pot plant that does well on a window sill, or a flamboyantly leafed, 'potted belle'. If flowering plants are given large amounts of houseplant fertiliser containing nitrogen, they will focus on growing their leaves instead of flowers. Verdant wall art is a care-free way to enjoy green plants in your home – the framed poster leaning against the wall is Paper Collective's Green Leaves. 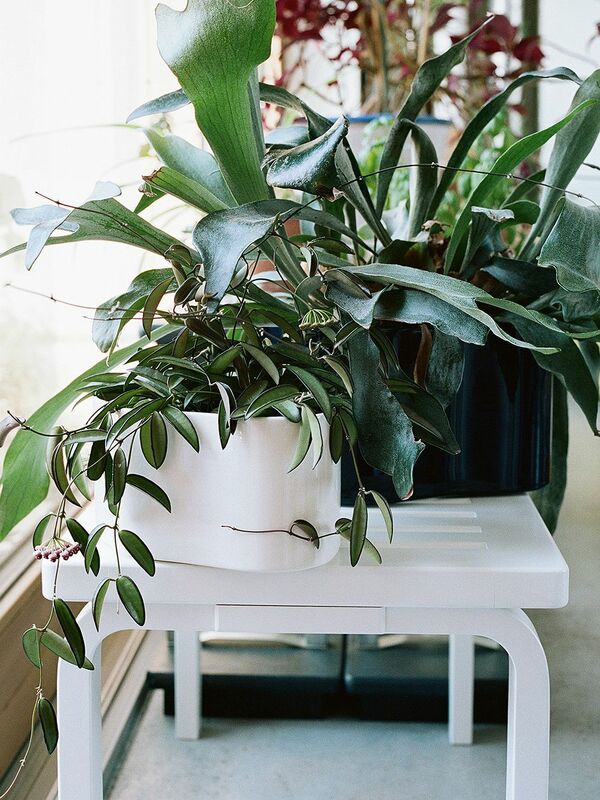 The white ceramic planter by Arabia is a flea market find, and the plant is a peperomia. 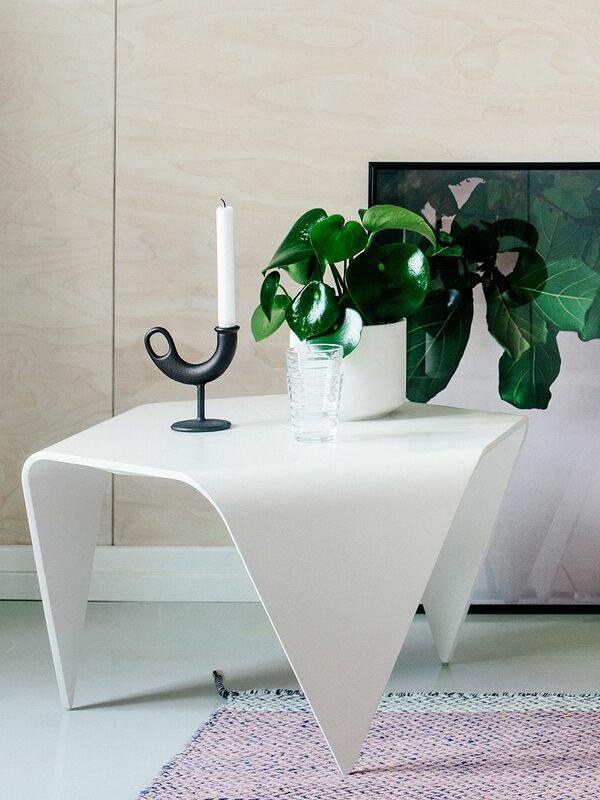 The Trienna coffee table is from Artek, and the Ildhane candleholder is made by Nedre Foss. Start buying new plants in the spring, when the spring sunshine will help them to settle in household conditions. It is best to choose the species according to the direction in which the window, at which it will sit, is facing. New plants should always be kept apart from other plants for a few weeks. During this period, they should be carefully checked for pests, to avoid the introduction of uninvited guests alongside the new arrival.